Once you’ve got your head around the basics of knitting, such as how to cast on and bind off, how to knit and purl stitch, and looked at some of the various yarns available, it’s time to start with your first easy knitting patterns. You’ll find plenty to choose from, particularly if you’re looking for knitting patterns for beginners, but there are also heaps of patterns for the more experienced. When you first start looking at beginner knitting patterns, you might be fooled into thinking it’s in some kind of foreign language. They can be very confusing, unless you’ve spent some time brushing up on the language of knitting. A range of different abbreviations and symbols are used to save space and make knitting patterns easier to read, once you’ve got the hang of all that knitting shorthand. There is a recognized list of abbreviations and symbols, used by designers and publishers in the yarn industry. We’ll help you out by looking at some of the most common. But bear in mind some may use special ones which we haven’t listed. You should be able to find a suitable explanation at the beginning of the book or pattern. K or k = Knit stitch. P or p = Purl stitch. CO = Cast on. How you begin each piece of knitting. BO = Bind off. Sometimes called casting off, and is the way you finish most knitted pieces. Inc = Increase. Refers to adding one or more stitches. An increase can be made by working in the front, and again in the back, of the same stitch. Dec = Decrease. Telling you to take out one or more stitches. The most basic way to do this is by working two stitches together. 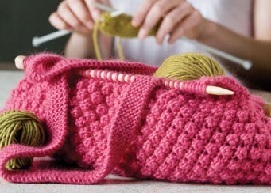 Increasing or decreasing stitches in different ways will change the way the project looks. Most, even the easy knitting patterns, will tell you how to do it. Rep = Repeat. Which is pretty self explanatory. Sl = Slip. It’s time to slip a stitch or stitched from one needle to another, without working it. YO = Yarn over. The yarn has to be taken over the needle. Tog = Together. Two or more stitches need to be worked together, which in essence is a decrease. Work even = Carry on as you have been, without any increases or decreases. Maintain pattern as established – You’ll usually find this instruction when you’re working a pattern stitch, increasing or decreasing at the edges. It requires you to keep the center part of the pattern as it’s already been set up, and add or subtract stitches at each end, while being careful not to disturb the pattern. Once enough new stitches have been added, they can then be incorporated into the pattern. This is just a brief explanation of some of the most basic knitting language. You’ll find more on the Craft Yarn Council website. Time to look at some of the symbols you might encounter. Much like abbreviations, symbols are used to save space, and make knitting patterns easy to read. They can sometimes be confusing, but don’t worry you’ll soon get the hang of them. Asterisk – * will be used to show when a series of steps needs to be repeated, often several times across a row. Brackets – [ ] will be used to enclose a group of stitches. It means that they need to be repeated a specific number of times. There will be a number that follows the brackets, and this tells you how many times you need to repeat the step. Parentheses – “ “ are sometimes used in much the same way as brackets. They are also used to indicate a group of stitches that must be worked together into a single stitch. As well as symbols, and abbreviations there are a number of terms you need to learn, in order to understand your knitting patterns. When you first start using beginner knitting patterns, there will be a number of terms you encounter that could be confusing. Let’s explain what they mean. Left front or left sleeve – This refers to the piece of the garment you’re knitting will be worn on the left front and arm of your body. Right front or right sleeve – This is the piece that’ll be worn on the right front and right arm. At the same time – This indicates when you need to work two different steps at the same time. Work same as left/ right piece, reversing shaping – For beginners this can be a little difficult. Let’s give you an example. Say you’ve worked a series of decreases on a right shoulder. Rather than waste space telling you how to do this on the left shoulder, the pattern will leave you to work it out on your own. Write down on a piece of paper what you did the first time an then do it in reverse. Now you’ve got a good idea of the language of knitting patterns, it’s time to get started with your project. We plan to feature plenty of projects over the coming weeks and months, so make sure you add us to your favorites. Some of the first projects we’ll be looking at will be baby knitting patterns, and scarf knitting patterns. It’s always best to start of with the basic designs, and move on from there once you’ve mastered them.